On August 5, 2015 the Margaree Salmon Association (MSA) participated at a meeting at Cheticamp Lake in the Cape Breton Highlands. The meeting was initiated by the Cheticamp River Salmon Association (CRSA) and arranged by N S Power. Réné Aucoin and Gilles Hache represented CRSA, while John Stinson and Bill Haley represented MSA. The issue was the lowering of water levels at the lake by 10 feet to allow for maintenance and heavy construction in support of the Wreck Cove Hydro Facility . The facility produces 50% of the province’s hydro power. The water levels will be low from June to November this year. This work was necessitated when new regulations for dams mandated that the D1 dam, (holding Cheticamp Lake), be made 3 feet higher and engineered differently. No more water will be held in the future, but the work will make the dam safer and less prone to failing. The work also involves clearing up the Canals, spillways and other work lower water levels allow. 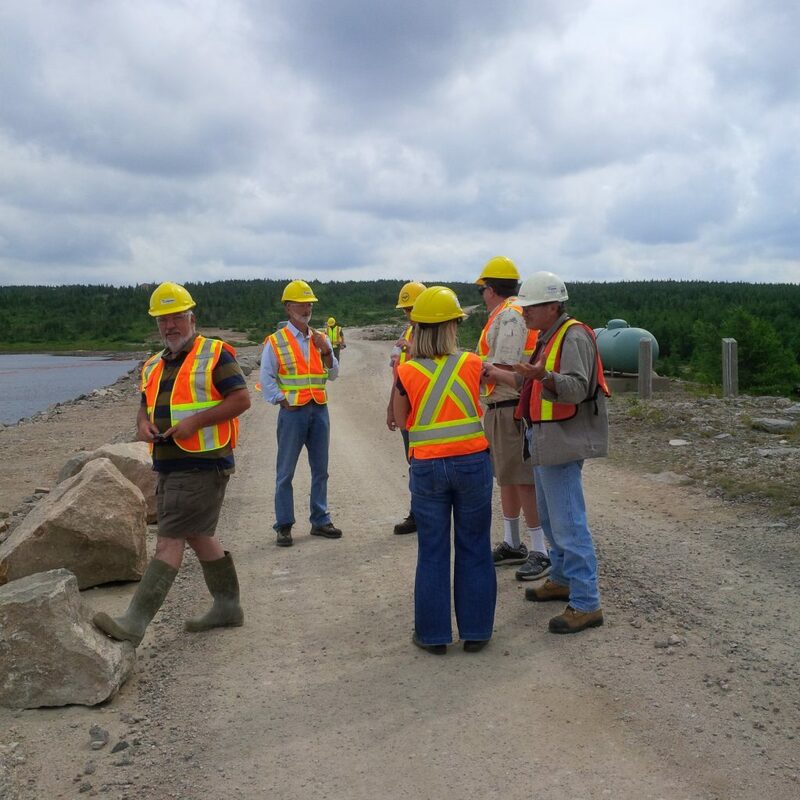 It is of interest to note that, before the dam was constructed what is now Cheticamp Lake was more of a bog area– the area was and still is the head waters of the Cheticamp River that flows west into the Gulf of St Lawrence. However, the water in this area is also used to power the Wreck Cove hydro plant and is diverted so that the water flows to the east, entering the the Atlantic through the Wreck Cove turbines. The Margaree River Salmon Association had received correspondence from members on this issue and were pleased to be invited by CRSA. After a slide presentation outlining the workings of the facility & a review of the construction plan, N S Power Representatives provided answers to our questions. The water flow released to the Cheticamp river was set in 1979 and remains the same at 41 cfps. There is no plan to reduce this volume. The issue of the water temperature of the lake was raised by both groups. It is presently not monitored, but the water is released from the bottom (cooler?) level of the lake. N S Power were open to looking into monitoring water temperatures. It would be an interesting piece of data for comparison to temperatures in the lower river. There was also discussion and agreement that previous Dept. of Environment monitoring stations should be re-opened on the Cheticamp River and it’s tributaries. Thus far in 2015, the lowering of the water levels have resulted in maximum water levels for the Cheticamp River. It appears that N. S. Power have met or surpassed commitments with the province in that regard. The Cheticamp River Salmon Association will continue consultation with N S Power and other interest groups. We volunteered our participation and support.